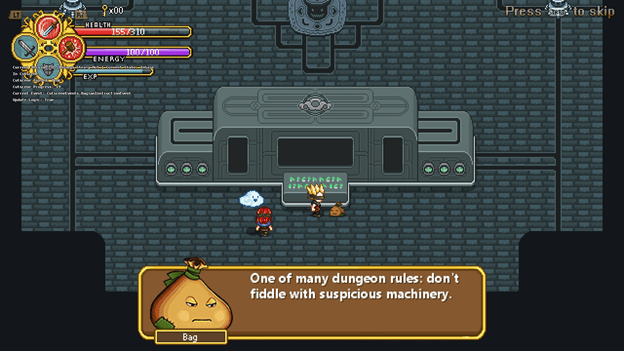 Secrets of Grindea is a great little jaunt through a Zelda-style world with a ton of RPG-style character customization and a lot of self-aware humor. 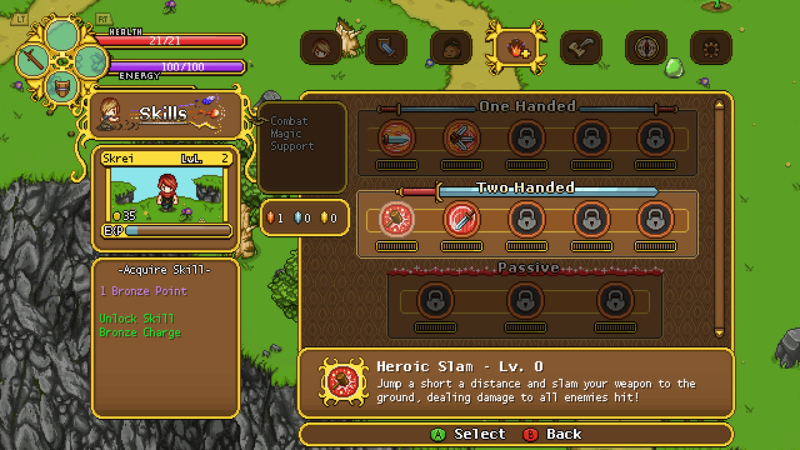 It’s like Children of Mana meets A Link to the Past, and it’s frankly delightful. It’s probably the only Steam Early Access game that I haven’t minded playing before it’s finished, and for me that Early Access tag is often a great big warning sign: “Wait for a while to see if this actually releases before playing”. One of the comments that came up on the podcast is that SoG is a retro-styled game that isn’t relying exclusively on nostalgia to prop it up. It’s a great description, and I pretty much completely agree with it. It’s the Zelda game that Nintendo will never make, because it’s designed for people who grew up on Zelda but have since moved on to more challenging, more complex games. Secrets of Grindea delivers on that– the bosses are MUCH more complicated and difficult than Zelda bosses, and progression is similarly advanced. My two biggest complaints with the game are the animation delay when swinging your weapon– it’s a gorgeous animation but it stops you dead, so it’s very difficult to stay mobile as a melee character– and the lack of a reasonable “full respec” option. Ashgar says this has a lot more to do with the fact that we played co-op (did I mention this game has a perfectly reasonable co-op story mode?) and thus had XP coming in a lot faster than money, but this is the sort of thing that needs a rebalance pretty badly. Presumably that’s something that can be done in the Early Access phase. Anyway, I found it easy to get locked into a build that I couldn’t do much about and wasn’t as functional as I would’ve liked. On the other hand, I thought it was awesome being able to fill in party roles in co-op; Kodra was playing a character build that would have been entirely untenable had he been playing solo, but was both functional and awesome in a group. The game cheerfully pokes fun at RPG and Zelda tropes without forgetting that both of those types of games are genuinely fun and awesome. A lot of parody games fall into the trap of just blasting away at a particular genre in the guise of “parody” and forget that there’s a reason people like those games in the first place. Secrets of Grindea hits a nice balance of both parody and genuine cheer, and it takes some jokes seen elsewhere and pulls them off extremely well. The best part about this game, for me, is the co-op multiplayer. This is probably not a shocker to anyone– I’ve talked a lot about how much I like small-group multiplayer co-op, but SoG reminds me that I almost don’t care about the genre; running around a game with my friends experimenting is a lot of fun. One thing I want in Grindea (though it looks like it’ll be added, given some of the NYI progression options) is a stronger “support” playstyle, with some heals and protection. It would really round out the rest of the group, which is mostly super defensive or super offensive, but lacks terribly much in the way of force multipliers. Another thing I think would be interesting to see is some more battlefield control options, slows and binds and knockbacks and whatnot– possibly I just didn’t see them in our playthrough, but they seemed relatively rare. All in all, though, the game is a lot of fun and I have no problem recommending it, even as an Early Access title. Even the unfinished story was fun enough to be worth the price of the game, and there’re updates coming apparently fairly regularly.